Luckily, in the so-called “summer of love” of 1967 there were people who didn’t necessarily need to dance to the tune of Jefferson Airplane and the likes. 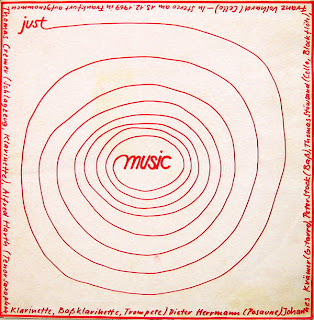 An interchangeable collective of classically trained German instrumentalists, Just Music (aka “New Thing Orchestra” in a few occasions) was also the first “humble but ambitious” ensemble that Alfred Harth formed to express different “opinions” about that unpronounceable disease named “free jazz”. This task was made much harder by the mental closure of Frankfurt’s jazz scene, at that time mostly revolving around a single deity - Albert Mangelsdorff - who kept refusing any contact whatsoever with Harth and his comrades, also calling free improvisers with unrepeatable adjectives. The same Mangelsdorff will ironically become an icon of the genre later on, but that’s another story; as we all know, official reports almost never coincide with the reality of facts. After several participations to various European festivals and TV shows, in 1970 the group got in touch with members of AACM, and both Harth and bassist Peter Stock became a part of the European Free Jazz Orchestra for an important festival in Frankfurt. In the 1967-70 span, the saxophonist had extended his interests in multimedia performances, including fireworks, breaking glass, concerts in churches playing other instruments without knowing the necessary techniques, and so forth. Many events and many sounds, contributing to define Just Music like an underground icon for which, mysteriously, there seems to be no real interest in resurrecting the scarce recordings that they released. One of them is this 1969 album, which - if you spotted the label - could look like a surprise given what Manfred Eicher’s imprint publishes nowadays (needless to say, the record is long out of print). 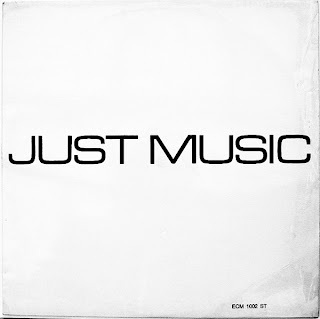 Divided into two long improvisations, one per side, “Just Music” sounds extremely modern to this day; it wouldn’t fall out of place on Martin Davidson’s Emanem, the extreme variety of timbres and dynamics at the basis of a spontaneous expression that results as completely unincorporated to these ears. The involved players in this instance were Alfred Harth (tenor sax, clarinet, trumpet), Dieter Herrmann (trombone), Johannes Krämer (electric guitar), Franz Volhard (cello), Thomas Stöwsand (cello), Peter Stock (bass) and Thomas Cremer (drums, clarinet). The musicians also use voices, mouthpieces, whistles, percussion and other useful things to create an anarchic swarm of howling tones, crying jams and cultivated virtuosity, the latter clashing - very effectively - with the air of thorough freedom that transpires from every minute of the LP. The presence of two cellos establishes a “contemporary classic” feel which is often negated by roaring outbreaks where both percussion and voices contribute to almost orgiastic environments; there are even a few moments of relative tranquillity, but one always has to sleep with one eye open. Probably, Mr.Eicher got a little bit scared by these guys, despite the fact that it was Just Music. Old Uncle Garbarek is certainly a more reassuring presence these days, but what about giving the reissue rights to someone who still wants to release Good Music?